Hm. Well. These two portraits may not be quite what Emily had in mind. But I get what she means. When we put our creative impressions on something– on anything– we start to see it in new ways, and hopefully our audience does too. If we can absorb our focus there, trying to reflect something we can’t really express, we tend to leave bits of ourselves there too– in the words, in the melody, on the canvas. In each picture is a whole lifetime imprisoned, a whole lifetime of fears, doubts, hopes, and joys. Whither is this lifetime tending? Regardless of what the final piece turns into, the process of recording and interpreting what we see, observe, feel or imagine– it transcends the ordinary. We unravel something we aren’t sure of. Hopefully, along the way, we stop trying to check the box or solve the problem (whatever that thing was that drove us into this). We grow more comfortable with the blurry act of simply making something out of nothing. I haven’t scribbled out all that many portraits in my life, but every time I do, I feel a strange sense of connection with what I’m seeing. I almost believe I can connect with and pay homage to that whole extraordinary being I’m observing. I almost feel I’m recording the entire imperfect, impermanent life before me, which is at the same time oddly mine too. A life full of what all our lives are made of: sadness and struggles and joys and beauty. But it’s the effort that gets me out of my everyday, out of my apathy, out of myself. And that’s the kind of adventure that makes life worth living, even if I never leave my desk. So on this overcast day in late January, I send you wishes for your own creative adventures. I wish for you the opportunity to look at something close by and look hard, really study it. That problem or idea you’re pondering, that view out your window, that stranger’s face. Then do all you can to try to express it. The transformation– of both you and it– will be worth it. Ah, thanks Trish! All very amateur, but fun nonetheless. Hope you’ve been making some art these days! This is so true! I think to see through the eyes of the artist is to see the whole world in a new and more profound way. Thank you for your wonderful insights, and for your delightful amazing portraits! Your blog is such a gift. Thank you for taking a look and for your sweet comments! I really appreciate it! Thanks so much! These are a compilation of people, plus a little made up. I appreciate your comments and support. I hope you are writing something fun! So great, Sarah. Fantastic. 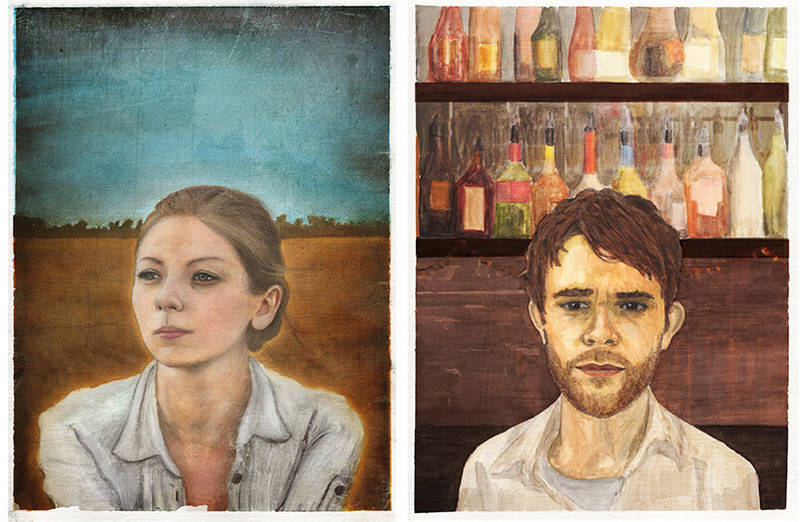 You really captured the human element in these portraits. The first thing I thought is “What are they thinking?” And I think that’s the same question I ask myself about the creatives I’ve met like you! Your mind is such a wonderful landscape; I look forward to exploring more of it through your sketches!! You’ve even inspired me to take up drawing again. For that, I’m extremely grateful. Thank you Rosie! That’s so sweet. And I’m so glad you are drawing! I’d love to see what you create. I love these Sarah! Beautiful! You are very talented!! Thanks Lexa for taking a look and for writing a comment! You’re the best! Hi Song! Thanks so much for taking a look and for your kind comment! I hope you and yours are doing well and that you are making your beautiful art. Would love to catch up sometime.